Tsar Wars: A New Hope? Before I start I have to admit to disliking more of Paul Magrs work than I like – I didn’t like Hornet’s Nest if that helps you peg where my thoughts lie. 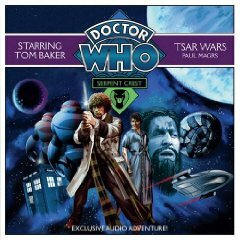 I picked this first volume – Tsar Wars – of a new Fourth Doctor series – Serpent Crest – up with trepidation – would it be a hit or a miss? This all feels rather harsh – there were some good points and good performances (mostly from the background characters i.e. the humans and robots). At some point I plan on listening to this story, but, like you, I was underwhelmed by “The Hornets Nest”. Tom Baker seemed to be playing himself, not The Doctor. I look forward to hearing what Big Finish does with him.